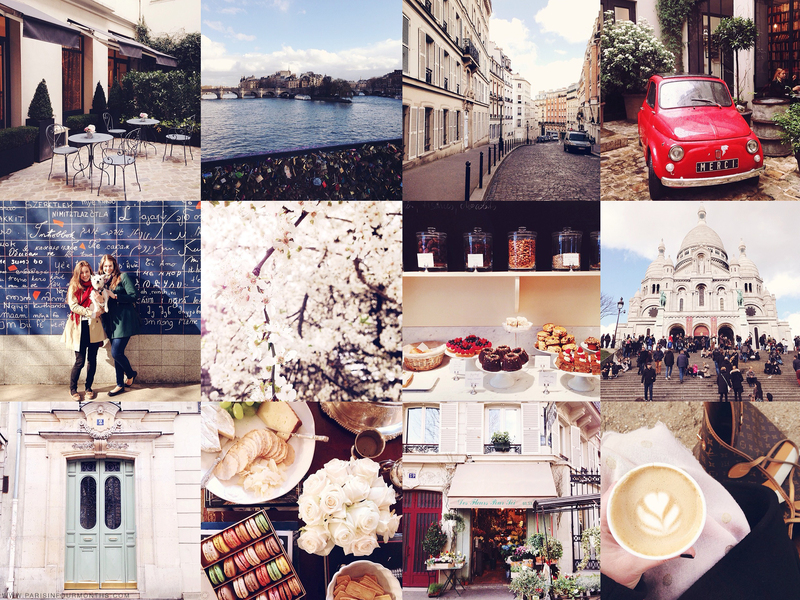 So a lot has been going on ever since I came back from Paris but these Instagram photos actually sum up a lot of the things I've been up to lately. I did a photo shoot for the luxury beauty brand Darphin and got to enjoy their adorable little courtyard, I strolled over Pont des Arts in between meetings, wandered around Montmartre on my day off, had breakfast at Merci, snapped this photo of my favourite Lauren and Katie (and little Daisy of course) in front of the "love wall", shot with Nicole under these beautiful blossoms. Had breakfast together with Louis Vuitton and Nicole at Claus, was welcomed back to Paris by beautiful weather and a stunning Sacré-Cœur, started photographing my beloved Parisian doors again, enjoyed macarons and tea with Moda Operandi, passed by cute little flower shops and had my morning coffee outside (!) in a park.